Edita Gruberová (born 23 December 1946), is a Slovak coloratura soprano. She is noted for her great tonal clarity, agility, dramatic power, endurance, and ability to sing high notes with great power and sustained vocal consistency, which made her an ideal Queen of the Night in her early years. In recent years, she has enjoyed huge success with a number of the most important bel canto roles. Gruberová began her musical studies at Bratislava Conservatory where she was a student of Mária Medvecká. She then continued at Academy of Performing Arts in Bratislava (VŠMU). While studying, she was a singer of the Lúčnica folk ensemble and appeared several times in the Slovak National Theatre. In 1968, Gruberová made her operatic debut in Bratislava as Rosina in The Barber of Seville. After winning a singing competition in Toulouse, she was then engaged as a soloist of the opera ensemble of the J. G. Tajovský Theatre in Banská Bystrica, Slovakia, from 1968 to 1970. Since communist Czechoslovakia was going through a period called Normalization, during which the borders were closed with non-communist countries, Medvecká surreptitiously arranged for an audition for Gruberová in the summer of 1969 at Vienna State Opera, which immediately engaged her. The following year, she made her first major breakthrough when she sang the Queen of the Night. Gruberová then decided to emigrate to the West. In subsequent years, she became a soloist in Vienna and was invited to sing at many of the most important opera houses in the world, especially in coloratura roles. Gruberová made her debut at Glyndebourne in 1973 and at the Metropolitan Opera in 1977, both as the Queen of the Night. In 1977, she first appeared at the Salzburg Festival, as Thibault in Don Carlo, under Herbert von Karajan. In 1982, she appeared opposite Ingvar Wixell and Luciano Pavarotti in Jean-Pierre Ponnelle's film of Rigoletto. Gruberová made her Royal Opera House début as Giulietta in Bellini's I Capuleti e i Montecchi in 1984. Other important roles she has sung include Zerbinetta, Gilda, Violetta, Lucia, Konstanze, Manon and Oscar; she sang Donna Anna at La Scala in 1987, Marie in La fille du régiment in 1987, Semiramide in 1992 at Zürich, Queen Elizabeth I in Donizetti's Roberto Devereux in Vienna in 1990. In 2003, she added title role in Norma to her repertoire, and sang it in Munich in 2008/09. She is an Austrian Kammersängerin and honorary member of the Vienna State Opera. 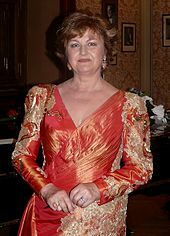 Gruberová has made many recordings, most notably in recent years full-length recordings and extended selections from Donizetti's Tudor Queens trilogy and other bel canto operas, lately exclusively on Nightingale label. More than a dozen of her filmed and televised opera appearances have been released on DVD, including Die Zauberflöte, Così fan tutte, Die Entführung aus dem Serail, Ariadne auf Naxos, Norma, Manon, Beatrice di Tenda, Lucrezia Borgia, and Linda di Chamounix. This page is based on the Wikipedia article Edita Gruberová; it is used under the Creative Commons Attribution-ShareAlike 3.0 Unported License (CC-BY-SA). You may redistribute it, verbatim or modified, providing that you comply with the terms of the CC-BY-SA.